If the name 'Colette' is remembered at all, it is because of one work: Gigi. That little tale of the courtesan-in-training in fin-de-siecle Paris was not all our Gallic wordsmith created. Now the biopic Colette tells part of her story, but an important part: her evolution to finding 'the woman within'. It is well-acted with traditional period piece trappings but with an interesting story about a literary figure that should be better-remembered. Covering the years 1893 to 1905, we see young Sidonie-Gabrielle Colette (Keira Knightley) having a secret tryst with Henry Gauthiers-Villars, better known as Willy (Dominic West). He's an author and publisher of some renown and despite Colette's lack of dowry, he wants to marry her. Marry her he does and whisks her from her rural village of Saint-Sauveur to cosmopolitan Paris, where Willy holds court at various salons. Gabrielle is still a bit of a 'country hick', but soon finds her natural gift for storytelling pays off. Willy presses her into writing down her tales of rural French schoolgirls into a novel. The result is Claudine a L'Ecole (Claudine at School), a saucy tale that sets even the blase Parisians aflutter. There's just a hitch in this: with Colette's verbal agreement Claudine at School is published under Willy's name. He has no problem taking the credit for this or more Claudine stories, but while Colette herself seems fine with this, his habit of picking up mistresses and spending the money from the Claudine stories starts grating on her. Not that Colette herself is some kind of nun. She starts picking up mistresses of her own, the lesbianism within starting to find outlets. At one point, she begins an affair with a Louisiana heiress. Colette first has Willy's willing consent, then she becomes enraged when he takes her mistress as his newest mistress. Belle Epoque Paris is quite decadent, isn't it? Colette continues to struggle against her dual desires to make Willy happy and be her own woman. She finds a surprising ally: the Marquise de Belbeuf. The Marquise openly dresses in drag, apparently her royal heritage gave her unofficial carte blanche to do so. The Marquise, while known as "Missy" (Denise Gough) would probably be considered transgender today: biologically a woman, Missy not only dressed like a man but had short, mannish hair and forced the voice to speak in a lower tone. Moreover, despite the name "Missy" Colette refers to the Marquise as "he" and "him". Willy has no problem with Colette's newest lover, though he enjoys ridiculing Missy's drag. He does have a problem with Colette now asking for joint writing credit on the newest Claudine book. Most in Paris' literary circles suspect she's the brains behind the operation, and Willy has been open about his wife being the inspiration for the character. Willy not only scoffs at the notion that 'a woman' could publicly take credit for the work but continues to exploit Mrs. Willy by having her and her paramour do a stage show, The Dream of Egypt, a dance at the Moulin Rouge whose lesbian lip-lock causes an uproar. Now forced to fend for herself, Colette takes to the stage, is urged to divorce Willy and chronicles her life in her own novel, The Vagabond. 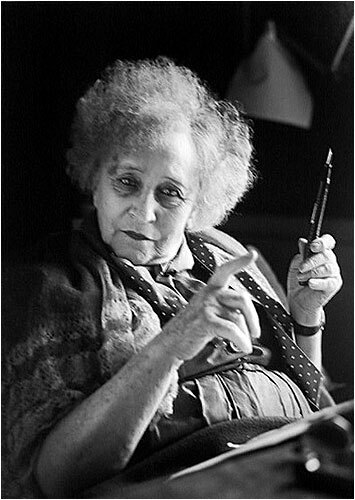 In a post-script, we find that Wily's secretary did not burn the original drafts of the Claudine stories, proving that Colette did indeed write them. She continued her own independent writing career, with Missy by her side. Colette is more about the marriage of Colette and Willy than it is about Colette as a whole, and I think it was a good decision to make less a biopic than a portrait of the union. It shows us the development of this woman into becoming her own being, though one wonders why she kept stayed with Willy. Director Wash Westmoreland, who cowrote the screenplay with Richard Glatzer and Rebecca Lenkiewicz, captures the beauty and decadence of the French turn-of-the-century society, with beautiful colors and costumes. He also does excellent work directing his actors. Keira Knightley is someone who has grown as an actress, and her Colette grows from a mere country schoolgirl to a woman of her own, discovering both Sapphic love and her own voice. She displays the love for Willy and hurt at his amorous betrayals, making one believe Colette would, despite the tortures she endured, still find in Willy something akin to love. 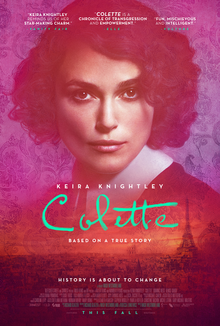 We see in Knightley's performance the evolution of Colette both as a woman and a writer, searching for something deeper, an identity of her own. West too is strong as Willy, someone whom one shouldn't like given how he can gallivant with broads and take credit for other's work (even if he had their consent). It's to his credit that he does not come across as totally monstrous but rather deeply flawed and blind to his own inflated sense of self. I never grew to hate Willy, but Colette was wise to not make him too empathetic. I think Gough may not be given enough credit for her gender-bending performance as Missy. She pretty much steals the film as our potentially transgender Marquise (I say 'potentially' since I don't think the film ever states that Missy perceived Missy's gender as male or was a lesbian who dressed in drag). Her performance is small compared to Knightley and West but all eyes draw to Gough, who unlike Willy remains loyal to Colette. The film draws heavily from the era in not just its costumes and production design but also in the score, with either outright usage of Debussy and Saint-Saens or at least music in that style. It lends an aura of authenticity in this costume picture of a time and place that is both elegant and decadent. Colette may not be the definitive portrait of the artist as a young woman, but it is a good primer into a life of someone most of us have not heard of or read apart from that little confection of Parisian mistresses. She was not Gigi in real life, but she was a fascinating figure whom we all could rediscover.